This new release into the hidden object puzzle adventure genre will make many happy. 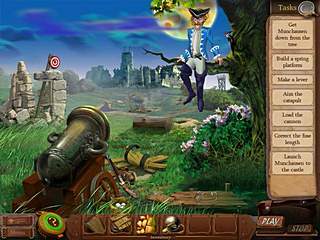 The Surprising Adventures of Munchausen is a game that is not typical for this genre, but it does make a great contribution to the genre. The biggest flaw of the game is its length. The graphics are bright and lively matching the humorous story and characters. The game is not dark and creepy and mysterious neither in its story nor in its graphics. The Kingdom is stuggling through its darkest times for some reason, and the only solution the king found was to marry his daughter to a strange guy to get some money from him. While the money would have solved the problem, the princess is afraid of this enterprise and she calls Munchausen for help. And he turns out to be a great character to follow in this story. He acts in the game as you would expect him to. The graphics are bright and lively matching the humorous story and characters. The voice over is just as perfect for all of the characters. 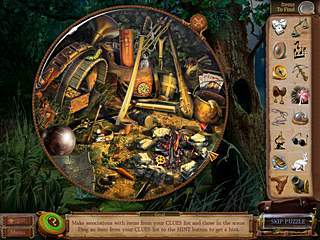 There are many hidden object scenes. All of the objects are accurately drawn, but not all of them are easy to find. The puzzles are fun to play despite the fact that some of them are very familiar. The game is very interesting to play without repetitious tasks. Even when you have to go back to collect something, it's different. The developers did a great job putting this game together, but it's seems to have been too challenging since the game is pretty short. This is The Surprising Adventures of Munchausen review. Download this game here.